It is rare that you attend an event where for the majority of proceedings (not just at the start), you are not aware of what is really going on. For the duration of The Dark Ages, many of the volunteers were assigned jobs but were not informed as to the bigger picture their contribution was making. Become a superfan of a band you have never heard? Paint the skulls? Karry a koffin? Pull North for the Second Leg? Bear a brick? What did these roles mean in the grand scheme of things? The level of blindly following the JAMs’ authority then got deeper. ‘Reposition’ a cone? ‘Borrow’ a shopping trolley? ‘Flypost’ for Badger Kull? Were you instructed to commit a minor felony, not knowing why but trusting the art that it was a part of? Prior to August 25th 2017, would you have fulfilled such a task if it had been directed at you from a different source? Did the dynamics of herd mentality and group membership influence your actions on this occasion? On Day 1, a private (public) hearing was held to find out why the K Foundation burned a million quid. The pair that committed the act were in attendance but refused to give a reason as they state that they do not know why they scorched the notes and instead they required for us to tell them why they had done it. This was no ordinary way to derive an answer. An expert panel gave their reasons as to why they thought Bill and Jimmy carried out the memorable act and a cast of witnesses expanded the story with their accounts from the time. Could ‘truth’ really be arrived at through such a process? How could any answer hold weight when it was not generated by those behind the act? Was this a parallel to our legal system? Or a comment on recent political voting processes? Could one binary reason really explain the antics of two individuals given the depth and scale of their actions? Was this all just a bit of fun? Had the legacy of the burning just being perpetuated again? Yes, maybe, possibly, a little bit, no. The K Foundation have become cemented in art history for their money reductionist episode. The major factor at play was the high value of the cash – £1,000,000 – and the reciprocal worth that we place on it. But did Jimmy and Bill flip this whole notion on its head at the public hearing? Every entrant was presented with a £1 coin but were not told what it was for – we were just instructed not to spend it. As the hearing unfolded, we were then informed by the host, Tom James that the coins would be used by us to vote for the ‘reason’ we felt was the ‘winning answer’. Why was money employed as a voting system? There was no need for currency to be the ballot paper of choice. There are many other ways of reaching diplomatic conclusions. Was this another comment on our political system? A test on our value of money? Yes, maybe, possibly, a little bit, no. 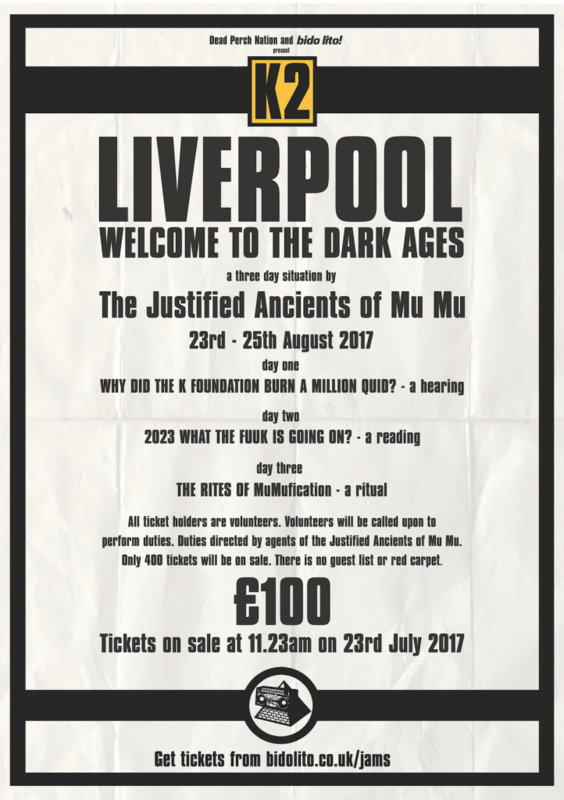 Cry to ‘Justified & Ancient’! Pull an Ice Kream Van! Wear a bright yellow poncho! Gather by a burning funeral pyre! Buy a brick for your ashes to be stored in a pyramid after your death! Go crazy for a band you have never heard of! Get a signed Graduation Certificate from Cauty & Drummond! The merchandise on sale ranged from traditional mugs to the rather bizarre, dead perch koffins. All items were priced at £20.23 or in multiples of that figure, apart from one. Copies of the book, 2023 were priced at the RRP of £17.99. An interesting exception – but as this item was technically not official merchandise and also not owned by Dead Perch, maybe the JAMs valued honouring the publishers retail price. A huge revelation was when The People’s Pyramid was announced. Instead of following the traditional post-life paths of either burial or cremation, have 23 grams of your ashes included in a brick that will then go on to form a structure made up of the remains of you and your peers in Toxteth. This is quite a radical departure from how we currently look at our passing. Did any of us expect to be questioning this area of our existence when we signed up for The Dark Ages? Many of the volunteers bought bricks following the announcement by CCC&D. The ideas and concepts have been embraced by a number of attendees. Is there something beautiful about becoming a piece of community architecture that will celebrate the legacy of many in one setting? Are your friends and family ready to accept your wishes if you have signed up to Mumufication? Does this new approach ask questions of the existing religious and non-religious attitudes to death?